If you remember wayyyy back in March, I posted about putting on my triathlon blinders for 12 weeks in preparation for Ironman Coeur d'Alene. Well, the race happened, I did well, and now the blinders have come off. And I've returned in a big way to the world of knobby tires, rocks, and roots, and I couldn't be happier. 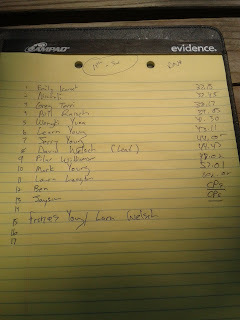 Dirt Crit #1 Results - photo by me! On the Thursday following Ironman, I found myself on the start line of a race. Too soon? Probably. 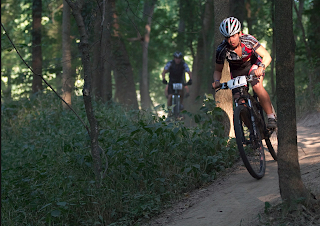 But Dirt Crits are a St. Louis mountain bike tradition, an excuse to get together with cool people on scorching Thursday nights and race like wild animals through the trails of Castlewood State Park. I had to be there. I didn't expect anything out of my legs, but I pleasantly surprised when they weren't overly sore and dare I say...SNAPPY...for the 30 minutes of all-out pedaling. 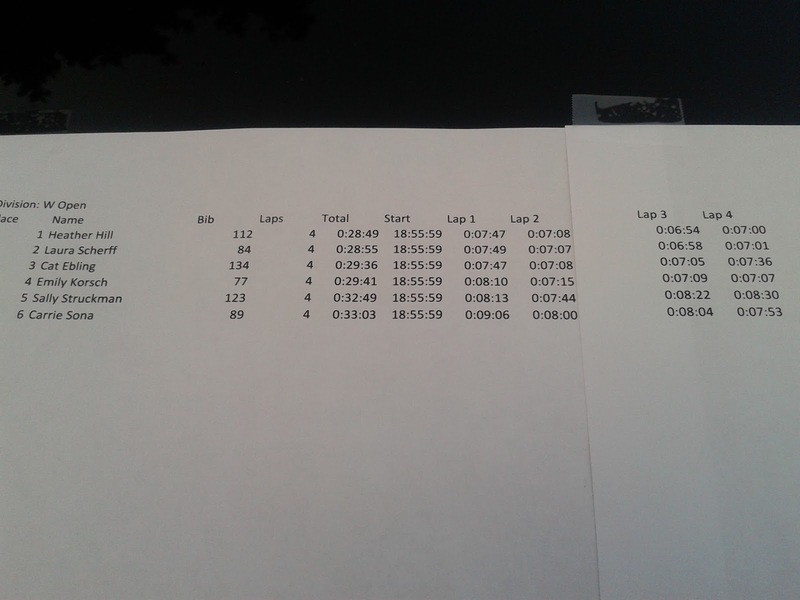 I negative split each lap and almost made the podium. I was ecstatic! 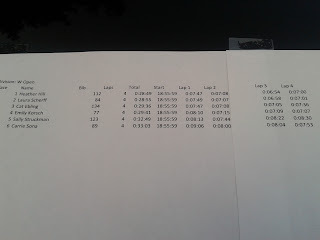 SLOC Tilles Park results - photo by me! Then on Saturday, SLOC held a sprint orienteering event in nearby Tilles Park. I was pretty sure my legs would be garbage but I can never turn down an opportunity to run on a map, especially one that's a 15-minute bike ride away. 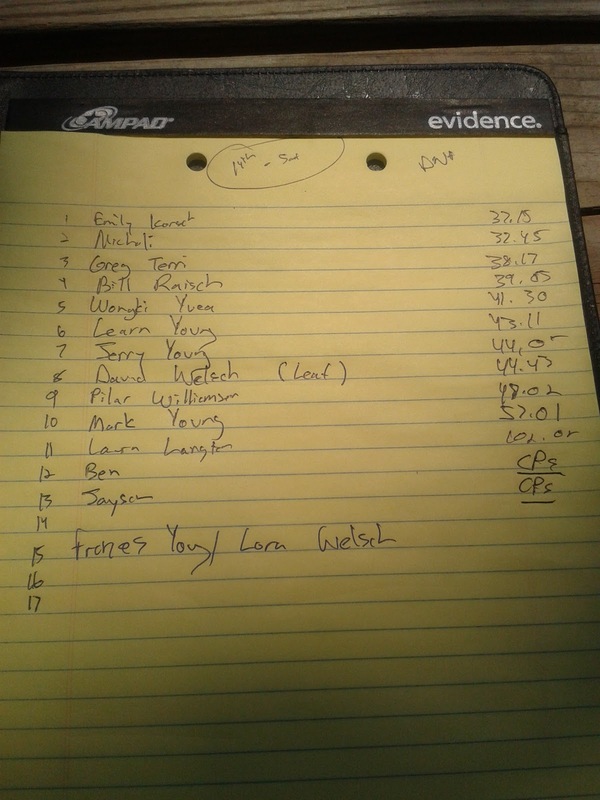 So I ran the rather unorthodox, multi-part sprint (that was actually about as long as a middle) and came out on top (except I mispunched a control so probably should be DQ'd). My left knee hurt towards the end so I knew I would be staying off of it for the next few days. Fortunately, there would be plenty of opportunities for biking! St. Charles Trifecta, including Matson (the middle one) twice. The Fourth of July rolled around. 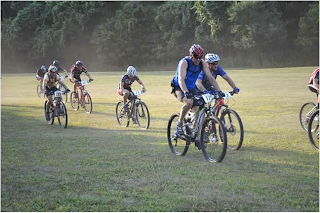 Time for another St. Louis mountain bike tradition, riding the "St. Charles Trifecta" which uses the Katy Trail to connect 3 parks' worth of singletrack for a 45-mile outing. Never mind the oppressive heat. 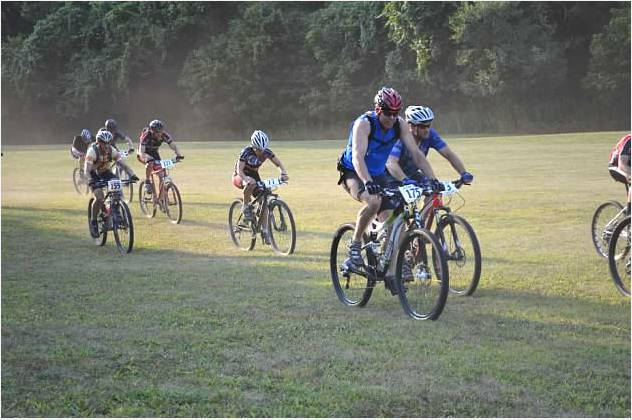 I teamed up with 2 guys preparing for Leadville MTB and 1 guy from work, and we rolled out from the Mound about 8am. We cruised through Lost Valley which I've ridden a whole bunch, and then hit up Matson where I've never been. I was really impressed with the trails at Matson - GORC has done an excellent job with the terrain and it's definitely worth the huge climb to get there! After descending back down to the Katy, the Leadville guys decided to go home, but I really wanted to do the whole trifecta so HH and I kept rolling on to Klondike, where we played on the teeter totters and huge drops on the park's west side. Okay...correction...I watched while HH flew over the huge drops. 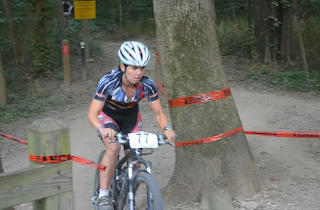 I'm getting braver on the mountain bike each day but not that brave yet! On the way back home we went up to Matson AGAIN to ride the new out-and-back section (more appropriately named OUCH-and-back) and then refueled on some much needed "orange treat" and Fitz's at the Defiance Bike Shop. Last but not least we crushed the upper section of Lost Valley to make the route a true trifecta and ended up with about 60 miles. Check. The Fourth was finished off with an awesome make-your-own-burger bbq at T & C's house. I had a beer. Or two. Life is good. The Fourth was on a Wednesday, so that means the next day was Thursday, which means another round of Dirt Crits! It was just as hot as the previous week, but my legs still showed up to play. This time, I didn't ride as well technically and got myself caught behind a few crashes. I had been in contact with the first place woman but saw her slowly slip away on the final lap after all of my matches were burnt, and finished in second place. Kind of a bummer, but Alpine Shop was handing out free icees after the race and the ChaCha food truck was selling tacos! Yes please! Saturday I invited myself along on a ride with members of Alpine Shop's AR team. 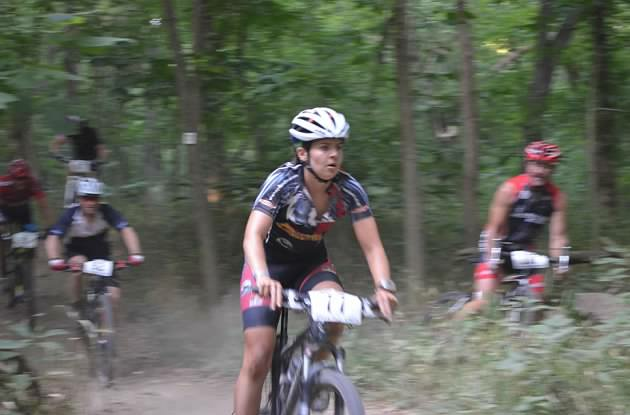 We hit almost everything in Castlewood in a few hours, and it probably would have been shorter if they weren't so nice as to wait up for me at the top of every climb (hey, I was trying to keep HR down). Finally we couldn't take the heat any more so rode directly to the creek and flopped in. It was so cool and refreshing, we forgot about the e. coli risk and stayed there until a little water snake came swimming up, causing me and Carrie to shriek and leap up out of the water. We are such girls. West County Trifecta, route inspiration from Ben B. Sure wish the pedestrian bridge at Route 66 State Park was open! 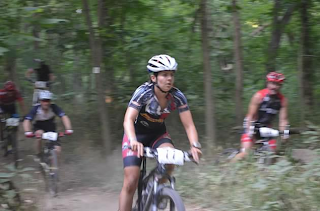 Sunday had me and HH itching to tackle another long mountain bike ride, so I dug up a route from Pfoodman Racing for a West County Trifecta, which connects Castlewood, Chubb, and Greensfelder parks. We started from Castlewood with a friend of his, then rode over to Chubb. Previously, I had only run at Chubb once and was kind of freaked out at the technical spots. But, the cool thing about mountain biking is that when stuff gets too hard, you can always walk it. And turns out the previous night's rain made the rocks slick as snot so there was a lot of walking. But, I made it through in once piece and I am proud to say my fear of Chubb has vanished. I still might not be able to ride the whole thing (especially not the steps) but I'm not afraid to try. The connector route from Chubb to Greensfelder is long and annoying. HH's friend was struggling with the heat and decided to bail in Eureka. So now a duo, we rolled on to Greensfelder and I rode that park better than I ever have, ever. Things finally seemed to fall into place and I was swooshing down the hillsides and grinding up the climbs and just feeling happy of myself. Not even a pinch flat on Dogwood could stop me; we changed it and kept crushing. The connector route from Greensfelder back to Castlewood is painless and even included a stop at SnoCone truck near the mini-railroad station. My, that was rejuvenating. We toodled around the Al Foster trail and western bit of Castlewood as I tried to find the entrance to Cedar Bluff loop - a short but awesome trail that has a little bit of everything packed into 2 miles. I made some nav errors here but eventually got us around in one piece and then it was a simple ride through the flats to make it back to the cars with another 60 miles. These last few days really hammered home the importance of "if you want to be good at something, do that thing". The always-proper Joe Friel has a good explanation of it, but I prefer Chuckie V's take. My bike fitness is good, but my technical skills were poor. 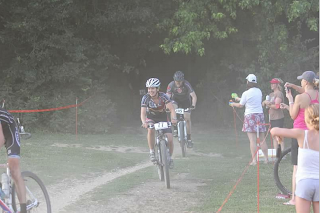 So I rode a bunch of miles on singletrack. Surprise! I became a better bike handler in a few short days. And I intend to continue this for the rest of the summer since I have a lot of work to do to maintain those handling skills at race speeds. That's a lot of miles you've packed in lately! Was that you we rode by in Webster Groves last night?